The world has begun to observe how China’s influence has grown in the international community. This was prompted by recent news of Interpol’s ex-chief Meng Hongwei who was taken down by the Chinese Communist Party (CCP) and is under investigation for graft and political disloyalty. Meng was also China’s vice minister of public security. Like Meng, members of the CCP have infiltrated various international organizations, particularly the World Trade Organization (WTO), International Monetary Fund (IMF), the World Health Organization (WHO), UNESCO and other prominent global agencies. They use their influence through these agencies to promote the CCP’s agenda. The World Trade Organization (WTO), the world’s largest economic and trade organization, has significantly helped China’s economy grow. But the CCP has taken advantage of the preferential treatment from the WTO and does not abide by the rules of international trade. The U.S.-China trade war is pushing the WTO to the forefront. In March, the Office of the United States Trade Representative (USTR) filed a request to take action at the WTO to address China’s unfair trade practices that go against the rules of the WTO. The WTO does not provide any definitions and rules for a “developing nation,” so a country can simply declare itself as one. China has taken advantage of this “self-declare” policy, a loophole, and identifies itself as a developing nation. So it is difficult to convince other countries that CCP is not playing by the rules. China’s total import and export volume has increased to $4.1 trillion in 2017 from $509.8 billion in 2001 when it joined the WTO. Since 2009, China’s exports have been the world’s number one. In the past five years, except in 2016, China’s total import and export volumes have also ranked first in the world. It is truly the world’s largest trading nation. Moreover, in recent years, China’s GDP has also ranked among the top-middle income countries. However, the WTO seems to have trouble dealing with such a special member like China. In July, after the WTO reviewed the complaint by the U.S. against China over unfair trade practices, it created a report that partly affirmed the CCP’s trade policy and made an appeal to China to make improvements in its trade practices. Without specific punishment, the CCP does not feel obligated to follow the rules of the WTO which has also been lenient in the past. For example, The New York Times reported in March 2014 that the U.S., European Union and Japan filed a case in 2012 against China for restricting the exports of rare earth elements and metals used in manufacturing and technology. The WTO did not require China to pay a fine but only requested it to stop the violation. Because of its soft stance on China, the WTO has shielded the CCP which allowed it to manipulate and violate international trade rules. While the CCP has rapidly increased its global trade status after joining the WTO, it has gradually increased its influence on the organization. In 2013, China became the world’s number one trading nation for the first time. Roberto Azevedo, a Brazilian diplomat supported by the CCP, was elected as the Deputy Director-General in the same year. Roberto Azevedo appointed Yi Xiaozhun, deputy minister of the Chinese Ministry of Commerce, as the Deputy Director-General of the WTO in 2013. According to the WTO website, Deputy Director-General Yi is in charge of market access, service trade, economic research, as well as intellectual property, government procurement and competition. The United States accused the CCP of unfair trade practices— the theft of intellectual property rights, government procurement and restrictions on competition. Moreover, after the United States criticized the CCP’s unfair trade practices and the negative impact it has on the U.S. economy and employment, Yi said, at the Sixth World Business Leaders Conference held in China last May, that trade was not the main cause of unemployment in the country. In addition, the CCP’s unfair trade practices have mostly benefited the CCP’s elite and dignitaries—they control China’s economy. The real victims are the Chinese people who do not reap the same benefits as their leaders. Among the forty-five commitments made by the CCP to join the WTO, the CCP only implements one of the seven economic policies promised, one of the four intellectual property commitments, seven of the twelve trade commitments, and fourteen of the twenty-two service trade commitments, with a total of twenty-three commitments implemented. In addition, what the CCP violates are key commitments that affect the vital interests of foreign investors and the Chinese people, such as forcing foreign companies to transfer technology, network blockades, restrictions on imports and various non-tariff barriers. 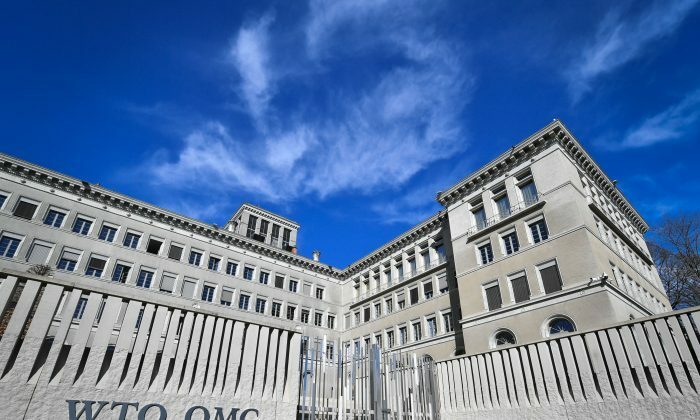 With the strengthening of China’s economy after joining the WTO, the CCP began to seek greater power in important international organizations, such as the International Monetary Fund (IMF) and the World Bank (World Bank), the two most important financial institutions in the world. In 2011, IMF Managing Director and Madame Chairman, Christine Lagarde, appointed Zhu Min, a Deputy Governor of the People’s Bank of China, as the fourth Deputy Managing Director. It elevated China’s position in the IMF. After Zhu became deputy managing director, he promoted the yuan to be included in the Special Drawing Rights (SDR) in 2015. China’s SDR quota share rose to 6.41 percent today from 3.99 percent in 2011 and the voting share rose from 2.4 percent to 6.09 percent, second only to the U.S. and Japan. The SDR, created by the IMF in 1969, are supplementary foreign-exchange reserve assets defined and maintained by the IMF. Although it’s not real currency, the CCP has been pursuing an increase in SDR quotas and voting rights to enhance the international status of the yuan and the CCP’s influence. In August 2016, Zhang Tao, the deputy governor of the People’s Bank of China succeeded Zhu and became the Deputy Managing Director of the IMF. Zhang is also a member of the CCP. As the U.S.-China trade war escalates, Zhang blames the United States and has repeatedly called on Washington to support the CCP. In April 2018, Zhang said Washington’s top priority for the global economy is to eliminate trade protectionism. On Oct. 10, Zhang told China’s state-run media, CCTV, that the biggest uncertainty in the current global economy is the trade dispute provoked by the United States. The World Bank, an international financial institution that provides loans to countries for capital projects, plays an important role in the rise of the CCP. From 2008 to September 2012, Lin Yifu, director of the China Center for Economic Research at Peking University, became the senior vice president of the World Bank. The World Bank upgraded China to the third largest shareholder of the World Bank in 2010, second only to the United States and Japan. In January 2016, the World Bank appointed Shaolin Yang, the official of China’s Ministry of Finance, as Chief Administrative Officer and Managing Director at The World Bank Group. As of April 2018, the World Bank had loaned China more than $60.495 billion. President Trump has said several times that the World Bank has granted excessive loans to China. In 2017, China’s direct foreign investment was more than $120 billion, ranking the third in the world. In the past 10 years, China’s foreign investment has grown at an average annual rate of 27.2 percent, ranking one of the largest foreign investment countries. However, World Bank President Kim Yong said in April that the World Bank would scale back loans to China but it would boost its shareholding (more voting rights) through increased capital lending approved by bank members. The CCP’s influence has grown in the World Bank. The CCP has been seeking greater power in the United Nations and its related agencies. In 2006, a former Chinese official was elected as the Director-General of The WHO. The World Health Organization (WHO) is a specialized agency of the United Nations that is concerned with international public health, and has 194 member states. In 2006, the CCP bribed African countries to elect Margaret Chan Fung Fu-chun, former Director of Health in Hong Kong, as the Director-General of the World Health Organization delegating China from 2006 to 2017. Chan was criticized of extravagant spending when she served as the WHO’s director-general. Despite WHO’s lack of funding, the senior executives of the WHO spent $200 million every year for business trips, far exceeding the expenses for major health projects, such as AIDS. Chan constantly supported the CCP while she was the Director-General of the WHO as her position was bought by the CCP. In 2013, the CCP concealed the outbreak of avian influenza A(H7N9) virus in China, causing the epidemic to spread rapidly. But Chan openly praised and thanked the CCP for its “prompt response and treatment” of the epidemic during the World Health Assembly in May 2013. At the international organ transplant conference held in Beijing in 2016, Chan sang the praises of the CCP’s so-called “organ transplant reform.” The conference was held around the time the international community condemned the CCP’s large-scale organ harvesting crimes, particularly on Falun Gong practitioners. An independent investigation led by two Canadian human rights lawyers published an updated report in 2016 about the organ harvesting which was first discovered in 2006, and the role of the CCP in ordering the systematic killing of prisoners of conscience for their organs. The United Nations Industrial Development Organization (UNIDO), a specialized agency in the UN system, promotes and accelerates industrial development in developing countries, and has more than 170 member states. In June 2013, the UNIDO elected Li Yong, the former Vice-Minister of the Ministry of Finance of China, as the seventh Director-General. In November 2017, Li was re-elected. Li, a member of the CCP, said during an interview by China’s state-run media in April that UNIDO had strengthened its cooperation with the CCP and organized activities for the “One Belt, One Road” project (OBOR, also known as Belt and Road). Since 2013, China has launched OBOR construction projects across more than 60 countries, seeking a network of land and sea links with Southeast Asia, Central Asia, the Middle East, Europe, and Africa. The United States has criticized OBOR projects, warning that the loans could turn into debt traps for poor countries unable to pay the money back. Li also supported the CCP’s “Made in China 2025” strategy. The strategy, unveiled by China‘s State Council in 2015, is at the core of China‘s efforts to move up the value chain and achieve Chinese leader Xi Jinping’s vision of turning the country into a global superpower by 2050. It would allow China to catch up with rivals in sectors including robotics, aerospace, clean-energy cars, and advanced basic materials. Under the plan, Beijing wants Chinese suppliers to capture 70 percent of market share by 2025 for “basic core components and important basic materials” in strategic industries. Such a large-scale plan to dominate global supply chains has alarmed the U.S. administration, which targeted “Made in China 2025” as evidence that Beijing has systematically stolen intellectual property (IP) for its own interests by guiding Chinese firms to acquire American tech firms; forcing U.S. businesses to transfer technology in exchange for access to the Chinese market; and other schemes. In an email correspondence, a spokesperson for UNIDO told The Epoch Times that UNIDO promotes the interest of all of its 168 member states equally. “The Director General believes that ‘The Belt and Road Initiative, with its emphasis on inclusive partnership and cooperation, can serve as an effective tool for the advancement of the 2030 Agenda,’” said UNIDO spokesperson Ravindra Wickremasinghe. The International Telecommunication Union (ITU), is an agency of the UN that is responsible for coordinating telecommunication operations and services throughout the world. In October 2014, Zhao Houlin, China’s former official of Ministry of Posts and Telecommunications, was elected as the Secretary-General of ITU. He is the first Chinese national to hold the title in the agency’s 150-year history. The International Civil Aviation Organization (ICAO), is an agency of the UN that is responsible for codifying the principles and techniques of international air navigation, with 192 member states. In March 2015, the ICAO elected Liu Fang, China’s civil aviation official, as the Secretary-General. Liu is the first woman and the first Chinese national to hold this position. She was re-elected as Secretary-General in March this year. The International Court of Justice (ICJ) is the principal judicial organ of the United Nations. The agency settles legal disputes between member states and comprises a panel of 15 judges elected by the General Assembly and Security Council for nine-year terms. In 2010, Xue Hanqin, an official of the Chinese Ministry of Foreign Affairs, was elected as a judge of the the ICJ, succeeding the Chinese national judge, Shi Jiuyong, and becoming the first Chinese female judge of the agency. The Asian Development Bank (ADB) is a regional financial development bank in the Asia Pacific region with 67 members. In 2013, the CCP arranged Zhang Wencai, an official of China’s Ministry of Finance, to serve as the vice president of ADB. In August 2018, Zhang said in an interview with China’s state-run media Xinhua News Agency, that the “One Belt, One Road” (OBOR) initiative had received wide support from the international community. The next step of the ADB’s major work is to promote the OBOR. In 2014-2015, the CCP initiated and established the Asian Infrastructure Investment Bank (AIIB), and appointed Jin Liqun, chairman of China International Capital Corporation, as the first president of the AIIB. In addition to the international organizations already mentioned, there are more CCP representatives who have held significant positions in other prominent international organizations. UNESCO is a specialized agency of the United Nations whose purpose is to promote peace and security through education, science and culture across the globe. It has 195 member states. In 2013, Hao Ping, Vice Minister of Education of the CCP, was elected as the President of the UN General Assembly for a two-year term. This is the first time in UNESCO’s history that a representative of China was elected as the chairman. UNESCO has the three core leaders: the President of the General Assembly, the President of the Executive Board and the Director General. In 2005, Zhang Xinsheng, then Vice Minister of Education, was elected as the President of the UNESCO Executive Board. The International Organization for Standardization (ISO) is an important global non-governmental organization which develops and publishes a wide range of standards in technical and non-technical fields, and facilitates world trade by providing common standards between countries. In September 2013, Zhang Xiaogang, Secretary of the Party Committee and general manager of Anshan Iron and Steel Group Co. was elected as the chairman of the ISO. He was the first Chinese national to be elected as the agency’s chairman, serving from January 1, 2015 to December 31, 2017. In 2010, Li Ruigang, then the director of Shanghai Radio and Television, was appointed as the first Chinese director by WPP Group, one of the world’s largest advertising and communication service groups. Several news agencies such as Bloomberg, The New York Times, and the Voice of Germany have published articles about the hidden dangers that Chinese officials may face in international affairs. By He Jian. The views expressed in this article are the opinions of the author and do not necessarily reflect the views of The Epoch Times.